A right femoral artery approach was performed, and, subsequently, a thoracic aortogram showed no evidence of a vascular mass supplied by the bronchial artery. The bronchial artery was not visualized. However, the late arterial phase of the angiogram showed a faint tumor blush projecting on the right lower lateral chest, but the feeders were not identiﬁed. Selective catheterization of the right subclavian artery and an angiogram were performed, which showed that the mass was supplied mainly by the right subscapular artery branches. Superselective catherization of the branches of the subscapular artery was performed with a Renegade microcatheter (2.8Fr 0.93 mm; Boston Scientiﬁc USA/Medi-Tech, Natick, MA) and contrast was injected. 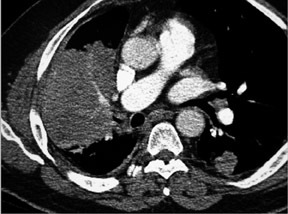 A hypervascular mass was seen on the right lateral chest wall (Figures 2 and 3). 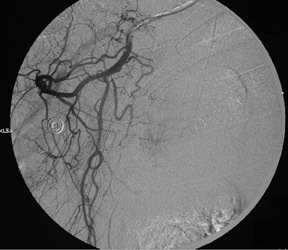 Subsequent embolization of the mass with a total of 2 vials of 300 to 500 µm polyvinyl alchohol (PVA) was performed. 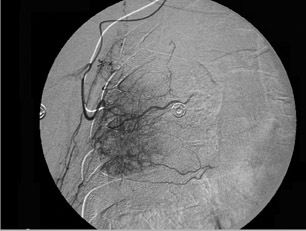 A postembolization angiogram conﬁrmed a successful embolization (Figure 4). The patient was observed for 24 hours to evaluate the frequency and severity of hemoptysis. The patient tolerated the procedure well with no evidence of complications. At 2-month follow-up, the patient had no further hemoptysis. Massive hemoptysis may result from various causes, most common of which are bronchogenic carcinoma and chronic inﬂammatory lung diseases. Other causes include tuberculous bronchiectasis, lung abscess, pneumonia, chronic bronchitis, pulmonary interstitial ﬁbrosis, pneumoconiosis, pulmonary artery aneurysm (Rasmussen aneurysm), congenital cardiac or pulmonary vascular anomalies, aortobronchial ﬁstula, ruptured aortic aneurysm, and ruptured bronchial artery aneurysm. Diagnostic studies for massive hemoptysis include radiography, bronchoscopy, and chest CT. 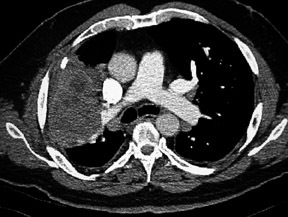 In a minority of cases (5%), massive hemoptysis may originate with the aorta or the systemic arterial supply to the lung, as was seen in our case.6-8 Nonbronchial systemic arteries can be a signiﬁcant source of massive hemoptysis, especially in patients with pleural involvement caused by an underlying disease. Missing the nonbronchial systemic arteries at initial angiography may result in early recurrent bleeding after successful embolization of the bronchial artery. Many investigators have documented that a concerted search for nonbronchial systemic arterial supply should be made. Massive hemoptysis is one of the most dreaded of all respiratory emergencies and can have a variety of underlying causes. In 90% of cases, the source of massive hemoptysis is the bronchial circulation.9 However, nonbronchial systemic arteries can be a signiﬁcant source of massive hemoptysis. Nonbronchial systemic artery embolization is a safe and effective nonsurgical treatment for patients with massive hemoptysis. This case is a rare example of a large vascular mass in the right lateral chest wall (which was supplied mainly by a nonbronchial artery, the subscapular artery) and of successful embolization of the lung tumor supplied by the subscapular artery. Remy J, Remy-Jardin M, Voisin C. Endovascular management of bronchial bleeding. In: Butler J, ed. The Bronchial Circulation. New York,NY:Dekker;1992;667-723. MacIntosh EL, Parrott JC, UnruH HW. Fistulas between the aorta and tracheobronchial tree. Ann Thorac Surg. 1991;51:515-519. Pearse EO, Bryan AJ. Massive hemoptysis 27 years after surgery for coarctation of the aorta. J R Soc Med. 2001;94:640-641. Remy J, Voisin C, Ribet M, et al. 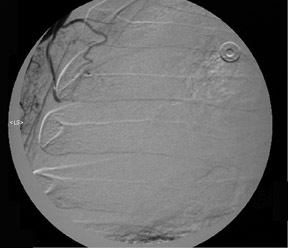 Treatment, by embolization, of severe or repeated hemoptysis associated with systemic hypervascularization [in French]. Nouv Presse Med. 1973; 2:2060. Fernando HC, Stein M, Benﬁeld JR, Link DP. Role of bronchial artery embolization in the management of hemoptysis. Arch Surg.1998; 133:862-866. Uﬂacker R, Kaemmerer A, Neves C, Picon PD. Management of massive hemoptysis by bronchial artery embolization. Radiology. 1983;146:627-634. Ramakantan R, Bandekar VG, Gandhi MS, et al. Massive hemoptysis due to pulmonary tuberculosis: Control with bronchial artery embolization. Radiology. 1996;200:691-694. Comment in: Radiology. 1997;204:875-876. Yoon W, Kim JK, Kim YH, et al. Bronchial and nonbronchial systemic artery embolization for life-threatening hemoptysis: A comprehensive review. RadioGraphics. 2002;22:1395-1409. Hemoptysis due to pulmonary metastasis of renal cell carcinoma. Appl Radiol.